Fast, flavorful, homemade marinara sauce recipe tops pasta, pizza and bruschetta. Secret ingredients? 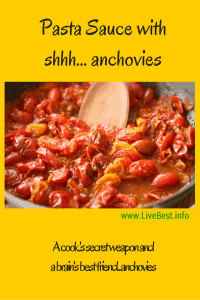 Anchovies and tomatoes deliver flavor and healthy dividends! The tiny, salty fish are a cook’s secret weapon because of the rich flavor and health benefits they deliver. The fat in fish is the good-for-you-kind. Omega-3 fatty acids are fats our bodies need for optimum health. Omega-3s from eating salmon and other oily fish offer protection against heart attack, stroke, cancer, and inflammatory diseases such as rheumatoid arthritis. It does this by thinning the blood and preventing it from sticking to your artery walls. That in turn may help lower the risk for blocked arteries and heart attacks. These fats help build better brain cells and keep them functioning. Evidence suggests that they’re also good for our mental and emotional health. Populations who eat more fish seem to suffer less depression and mood disorders including seasonal affective disorder. The American Psychiatric Association agrees, saying that omega -3s are important when treating depression. About 8-ounces of fish per week is a good target. 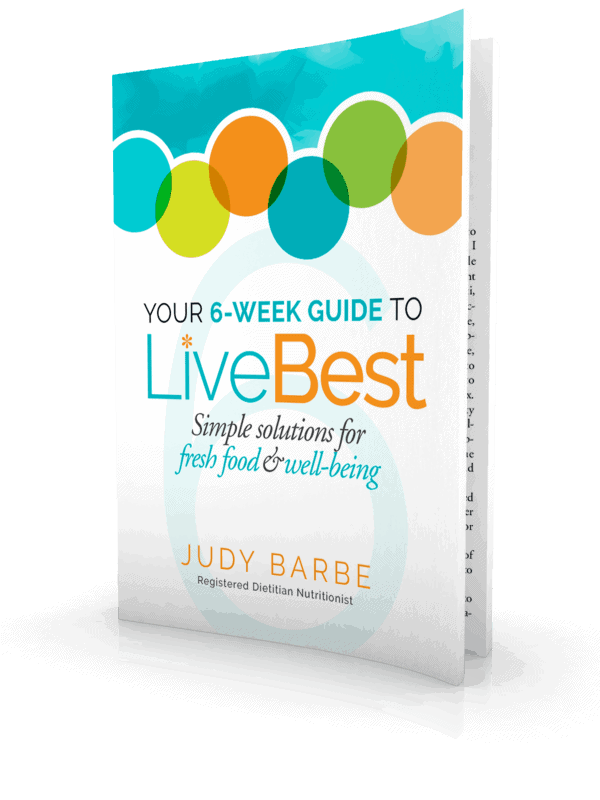 Use healthful cooking methods such as baking, broiling, poaching, or steaming, not frying. Fish that have to work hard in cold water and travel long distances have higher amounts of omega-3s. 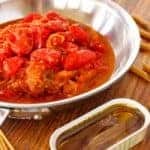 Seafood and fatty fish such as wild salmon and canned sockeye salmon, anchovies, herring, albacore or skipjack canned tuna, sardines, and trout, are some of the best sources. Farmed fish such as tilapia and catfish have lower levels of omega-3s. Anchovies make the list of hard workers. They have short life spans and reproduce quickly, so are resilient to fishing pressure and remain plentiful. Another benefit is their convenience. Cans are small, but anchovies are big on flavor. Once opened, they can be refrigerated for at least two months if covered with oil and sealed airtight. Some people love the salty flavor, others, not so much. To lessen the saltiness in anchovies, soak them in cool water for about 30 minutes, then drain and pat dry with paper towels. I’ve heard from readers that they get confused when they try to buy fish. To make sure I have fish on hand, I’ve been ordering fish for home delivery via Vital Choice, an online retailer selling wild-caught, sustainably harvested Alaskan salmon and northwest Pacific seafood such as halibut, tuna, shrimp and lobster. I ordered anchovies to give as gifts and to use int is recipe! 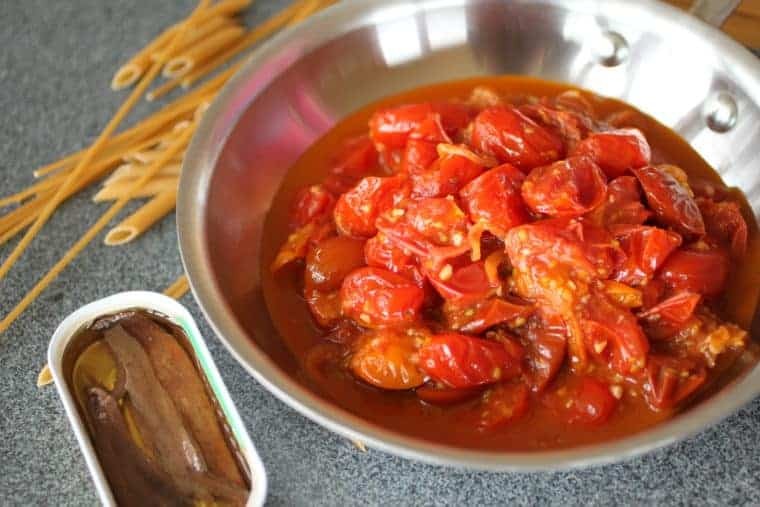 Here’s an easy way to try anchovies — cooked into pasta sauce. They melt into the sauce so you don’t see them. 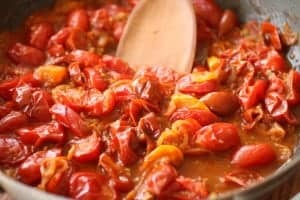 Add them to jarred tomato sauces, stir them into scrambled eggs, or blend them into salad dressings. Few people will recognize the flavor, but they’ll be amazed at what a good cook you are. This recipe is good as a pizza topper and served over pasta. Heat oil in large skillet over medium heat. Add garlic and shallot, cook, stirring occasionally, 3 minutes. Add anchovies, stir to break apart. Add tomatoes, red pepper flakes, and oregano or basil. Cook and stir occasionally 10 minutes.